Almost all adoptive parents have the same initial fear – will my child love me? This worry is natural and nothing to be ashamed of. “Truth be told, there is probably not a birth parent alive that doesn’t share these fears on some level as well,” says Davenport. However, it’s also nothing to really worry about either. “If we do our job well, their birth family will hold a special place in their heart, but so will we,” adds Davenport. These things just take time. “With some patience, consistency and creativity, you and your child will slowly create that connection you both desire,” adds Sharp. The first thing you can do is just relax. “Forming a bond between you and your adopted child will take time,” says Sharp. “Don’t expect you and your child to be instantly bonded the second they walk through your door,” especially when dealing with an older child. While welcoming a new child into your family is an exciting time that extended family and friends want to be a part of, it is important to give your child time to adjust. This means privacy. One of the most important things you can do as a parent is to create a routine – a set structure to the day. This means waking up at the same time, eating meals at the same times, and going to bed at the same time. “Children coming from foster care/institutions crave structure and routines,” says Sharp. “It helps give them a sense of control and allows them to develop trust.” This type of routine will help normalize your situation and allow your child to grow more comfortable in his or her new environment. While it’s important to create a routine, it is also important to have fun! Taking a Family Photo: “Having a picture of you and your child near their bed will help reaffirm every night when they go to sleep and every morning when they wake up that they are part of your family now,” says Sharp. Do You Have Adoption Questions or Need Someone to Talk To? Davenport, Dawn. “Will My Adopted Child Love Me As Much As If I Was His Birth Mom?” Creating a Family, 2 Apr. 2018, creatingafamily.org/adoption-category/will-my-adopted-child-love-me-as-much-as-if-i-was-his-birth-mom/. Kuligowski, Susan. 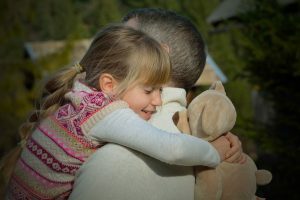 “5 Ways to Create a Strong Bond With Your Adopted Child.” Adoption.com, adoption.com/5-ways-to-create-a-strong-bond-with-your-adopted-child. Sharp, Nora. “Eight Attachment Techniques to Use with Your Adopted Child -.” MLJ Adoptions, 21 Aug. 2014, www.mljadoptions.com/blog/eight-attachment-techniques-to-use-with-your-adopted-child-20140820. Wheeler, Candace. “Adopting an Older Child.” Michigan Adoption Resource Exchange, mare.org/For-Families/New-to-Adoption/Adopting-an-Older-Child. This entry was posted on Friday, June 8th, 2018	at 2:05 pm	. You can follow any responses to this entry through the RSS 2.0	feed. Both comments and pings are currently closed.